Shop TLOTH - Art is everything. All of the below magical gifts are high quality expressions of love and creativity and available to you for a suggested donation amount, you may exceed this amount to reach even more in need through art therapy. All proceeds go directly to The Light of The Heart. Items will be shipped via USPS Standard Mail. Thank you for joining the Art Therapy Movement! Select appropriate shipping rate below and add to cart. Your order will not be processed unless accompanied by shipping payment. * Every $50 donated provides a group for at-risk youth or the elderly. Wear The Light of The Heart. Share Love and Creativity. 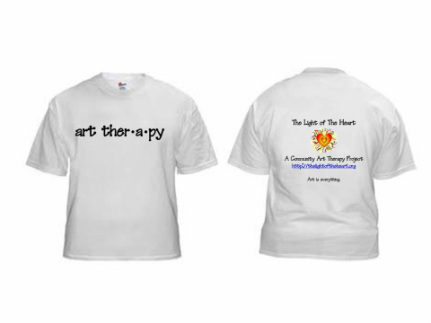 For every t-shirt you purchase you will provide one community art therapy group; up to 12 people! Join the art therapy movement with this T! Handcrafted just for you and made with love. Nothing overly fancy; short, sweet and to the point with two simple words that change so many lives. T-shirt is preshrunk and 100% cotton. We waved our color wand and added a little color to the Original T! Handcrafted just for you and made with love. T-shirt is preshrunk and 100% cotton. Share The Light of The Heart and spread love and creativity. The Light of The Heart Cards are created from images that inspire. Top fold white cards, left blank on the inside for your message of love; ideal for any occassion. A set of 8 cards and 8 envelopes with a different inspiring image on each card. Each set is unique, no one set has the exact same images. For every set of cards you purchase, you will provide art supplies for three individual art therapy sessions. Every two prints that you purchase will provide an art therapy session for an adult or child in need. Images created by TLOTH's Board of Directors with love.